Made up of Dave Brockie (bass and vocals), Russ Bahorsky (guitar), and Sean Sumner (drums), Death Piggy was formed in 1983 in Richmond, VA. Steve Douglas (guitar) joined the band in 1985. As a three-piece "silly-core" band, they blazed their way to regional fame before running into the Slave Pit in the bowels of the Richmond Dairy. 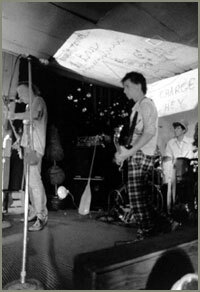 Death Piggy often staged "mini-plays" and used crude props (like a pinata full of catshit) to punctuate their ridiculous music, so it was only natural for them to be absorbed by the Slave Pit and mutated into what would one day become GWAR. Death Piggy put out three 45's in a span of years from 1983-1987 (Love War, Death Rules the Fairway, and R45) and Slave Pit released a compilation of all three records in CD format in 2000. Good luck finding any of them!